Hi, our names are Kristen and Maggie. We like Lady Gaga, reading strange books, and shopping for shoes. 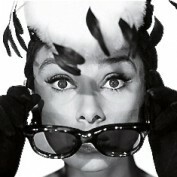 If we were one person, we believe that we would be Holly Golightly. However unlike dear Holly, instead of relying on prostitution for money, we’ve turned to Hubs. Obviously, we love to write. Both of us have a passion for the arts which translates heavily into our writing. We hope to fill our readers with artistic and wonderful ideas. And if you've never seen Breakfast at Tiffany’s? You should probably get on that.